USB flash drives were born from the need to transfer large amounts of data quickly. You'd be hard pressed to find someone who doesn't have a flash drive of some sort. They have become quite popular and rightfully so. They feature the added convenience of being able to quickly remove and delete files whereas a CD or DVD must go through a much more tedious process. Furthermore, USB flash drives can be plugged in to any USB slot on your computer and within seconds, your data is right at your fingertips. This guide will explain some of the key terms to look for when shopping for a USB flash drive and recommend some of the top ones currently available. Without a doubt, the most important aspect of USB drives is their data transfer speed. The latest technology uses the USB 3.0 specification and can achieve speeds of 5 Gbit/second, which is much faster (about 10 times) than the older USB 2.0 specification (480 Mbit/second). In order to take full advantage of the speed, your computer must have USB ports that meet the 3.0 specification. In other words, in order to transfer data at 5 Gbit/s, your flash drive and motherboard must both use the USB 3.0 specification. Do not fret if your computer does not have USB 3.0 ports because the flash drive will still work with USB 2.0 ports, however, they will only transfer data at USB 2.0 maximum of 480 Mbit/second. The next important feature to look for when shopping for USB drives is the storage capacity. Similar to hard drives, USB drives have a maximum capacity of data that they can store. If you are planning on moving lots of files or even files that are large in size, consider purchasing a USB drive with at least 16GB of storage capacity. Even if you don't use all 16 GB of the capacity available, you'll be glad to know its there in the instant that you need it. With the increase in popularity, USB flash drives can now store and install Operating Systems. Operating Systems are typically about 1 GB in size and this will more than easily fit onto a USB flash drive. You no longer have to hunt through your computer supplies remembering where you put your Windows XP disc, you can keep it right on your flash drive! With the above features in mind, we can now look at some of the latest USB flash drives available. 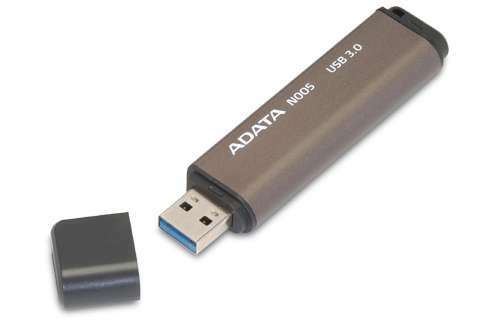 The ADATA AS805-4G-CGY USB Flash Drive is a great choice for a budget minded shopper. With 4 GB storage capacity and the 2.0 specification, This drive can store plenty of pictures, song, and other important documents all the while featuring a not-to-be-beat pricetag of about $10. For those who are after more storage, look no further than the ADATA AN005-16G-CGY Nobility N005 USB Flash Drive . With 16 GB of storage capacity available, you have plenty of room for family movies, backing up important data, and loads of songs and pictures. Checking in at about $35, this drive is a great deal for those needing a bit more storage space than the 4 GB model. Finally, for the those requiring massive storage space, see the CORSAIR Flash Voyager GT 64GB USB 3.0 Flash Drive . With 64 GB of storage capacity and the USB 3.0 specification, you will have all the storage and fast transfer speed you need at your fingertips. Produced by a quality brand in Corsair, you can't go wrong with the Voyager Flash Drive. USB flash drives continue to grow in popularity for several reasons. Their ability to move data from one place to another quickly, reliably, and cost effectively, makes them the ultimate in data transfer. With several models available, deciding on the right features for you (and your budget) narrows down the selection process. If you find yourself constantly burning data to CDs then the larger storage capacity might be the most appealing feature to you. If you need to move data from one computer to another (from work to home or vice versa) then the USB 3.0 specification with the faster transfer speed would be the most important aspect when shopping.